Diez minutos de descanso is the title of a painting by Cuban artist Flora Fong. Four stylized royal palms, the gigantic native plant of the Caribbean, support a huge coffee filter on top of a jar. The latter, in turn, stands above an also stylized flame, while water runs across the coffee powder. From the coffee pouring into the container rises the aroma. On the left, a person with a hat is seated on the floor with legs drawn together. Leaning against the huge filter base, the man looks out of the painting. In his hands, resting on his knees, he holds a long flat object from which smoke also rises to the filter. The fine smoke, initially white and then darkening upwards, makes one think of an over-dimensioned Cuban cigar. The stranger makes a pause outside a city hinted toward the back with a few strokes. In full calm he takes a break. The painting’s background surrounding the palms, as well as the funnel and jar are reddish brown, while the palm trunks are bluish and the spaces remain white. Due to the ordering of colors and forms, the painting might be interpreted as an abstraction of the Cuban national flag in vertical position. But this is not Flora Fong’s intention. She rather wishes to convey the joy of living, symbolized by the Cuban elixirs of life: coffee and tobacco. Given that the artist has chosen Diez minutos de descanso as the central image of her first exhibition with catalogue in Switzerland, this becomes a parable. Her message to the inhabitants of the restless western world is to stop, become conscious of life and enjoy it. The modification of the typical Cuban coffee filter equals a broad synthesis of art as elixir of life. The painting’s language fully corresponds to the artist’s previous work. Both the royal palm and the distinctive black line are repeatedly present in Flora Fong’s paintings. The Cuban national tree is represented in most cases ideographically reduced and suggests her Caribbean fatherland. The dominant black trace of the brush, in turn, visually recalls Chinese ink painting, with which she alludes to her Chinese origin. The theme of migration is frequently found in her works: after having studied Chinese calligraphy in the Academy in Havana, Flora Fong carried out extensive studies in 1989 during a trip to China, her father’s fatherland. In Diez minutos de descanso she merges both countries of origin and achieves a unity: the Cuban royal palm as Chinese calligraphy. 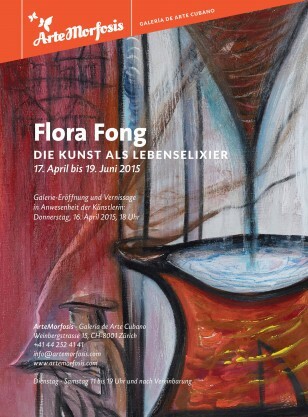 Flora Fong is one of the best-known Cuban female artists and one of the first women who finished art studies in post-revolutionary Cuba1 and developed a professional career as an artist. Active in art since 1970, she assumed a forerunner role as a woman on the Cuban art scene. All this happened at the time Cuba became a socialist State after the 1959 revolution under the direction of Fidel and Raúl Castro, Camilo Cienfuegos and Argentinean Che Guevara. The political transformation brought about the corresponding con- sequences. Culture – music, visual arts, literature and dance – was promoted explicitly as a propaganda poster of the revolution. During approximately 50 years, the Cuban art scene developed in a closed society in which the artists of one generation trained those of the next. It was only thanks to the National Museum of Fine Arts, founded in 1913 in Havana, that Cubans could learn about the history of European art. Here are works of old Dutch, German, English, Flemish, French, Italian and Spanish masters, next to South American works of art. For a long time, it was only possible to travel legally outside of Cuba by following a complicated procedure of approval that conveyed high costs and also required an invitation from abroad. With the long-awaited 2013 reform, the bureaucratic obstacles were greatly reduced and the departure authorization was eliminated. The new, inter- nationally appreciated regulations on travel represent a clear opening towards the world. Artists can in principle travel freely; however, in practice only a few can afford it. Internet and information coming from abroad continue to be controlled by the State. Thus, for example, in Cuba one cannot buy foreign magazines or newspapers. The normalization of diplomatic re- lations announced in 2014 by the heads of State Barack Obama and Raúl Castro will start moving many things in this field. Even today the Internet is not a reliable source of information. Not only due to the censure but also to the technical level in the Caribbean island State. Internet surfing with broad band such as we know it in Switzerland is not known in Cuba. Generally the Internet is accessed with 57 kb/s modems, as was the norm in Switzerland in 1998. Nevertheless, a few artists have installed a web site for themselves, to allow for international visibility. Also universities and academies are increasingly – with limitations – putting Internet at the disposal of their students. Gallery owners and collectors from the near-by United States of America increasingly tour the studios of Cuban artists since the U.S. started normalizing its diplomatic relations with Cuba. Indeed, the U.S. embargo did not restrict com- merce with art, literature or music from Cuba, which could be imported and traded freely. On the other hand, U.S. citizens could barely travel to Cuba (and Cubans, if ever, to the U.S.). Thus, no real cultural exchange was possible. The curiosity of European galleries is now being awakened, and it is only a matter of time that the interest of the inter- national art scene will focus increasingly on Cuba.3 The hitherto isolated cases of cultural exchange with the island State are now possible at a larger scale. Cuba will be a growing theme in art fairs and biennials. So it is only natural for a new gallery to open in Switzerland dedicated to Cuban art, which will initially focus on the Caribbean island’s well-established artists; on those who paved the way for the younger generations. There is a need to catch up with the presentation of Cuban artists outside their country, and with cultural exchanges abroad. The present atmosphere of political transformation with an opening towards the western world hints at an interesting and dynamic phase that will enable Cuban art, for the first time, to reach new shores. On these new paths, to take a ten-minute break (Diez minutos de descanso) over and over again, is a wise advice from artist Flora Fong. 1 Graduated from the National School of Art of Havana. 2 Ines Anselmi and Eugenio Valdes Figueroa (Hrsg. ), Neue Kunst aus Kuba. Art actuel de Cuba. Arte cubano contemporáneo, La dirección de la mirada, Edition Voldemeer Zürich, 1999. Neuere Literatur zur Entwicklung der bildenden Kunst in Kuba vgl. Joseph Kiblitsky / Barbara Thiemann, Kunst aus Kuba, Palace Editions, 2002. Nathalie Bondil, Cuba: Art and History from 1868 to Today, Prestel, 2009. 3 See Cash 03.01.2015: Kuba als nächster heisser Kunstmarkt (Cuba as Next Hot Market for Art), www.cash.ch: “Up to the present, the Cuban art market has remained on the fringes of the international public. After U.S.A. suddenly changed the course toward reconciliation, the threat of a mass avalanche of art collectors appears“.